How easily do I forget my love of beets. Growing up I was not a fan... because the only beets I had came out of a can. After realizing how much better fresh beets are when roasted, I have a new love for them. 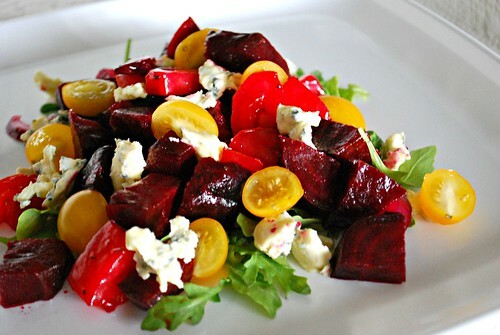 If you can get a hold of different varieties of beets, such as golden ones, try using it in this recipe! They are so colorful and have a nice flavor making it a good salad when combined with tomatoes. Add the water and place beets onto trivet in the IP. Press MANUAL and adjust the time to 24 minutes on HIGH pressure. Once at pressure, the display will reflect 24 (the number of minutes you initially set) and will begin to countdown to 0 minutes. When the IP beeps after pressure cooking for 24 minutes, turn the setting on top of your IP to VENTING. Doing so allows the IP to quickly release any remaining pressure (also known as QPR or QR). I use a wooden spoon to carefully turn the setting to avoid close contact with the potential steam. You may also want to turn your IP away from cabinets to allow the released steam to escape freely. The pin at the top of your IP will drop when all pressure has been released and it's safe to open. Transfer beets onto a cutting board and allow to cool slightly. Using a paper towel, rub the skins off the beets. Cut the beets into bite sized pieces. Combine the olive oil, mustard and balsamic vinegar in a bowl with a whisk. Add beets and tomatoes to the dressing and toss to coat. On a serving platter, place the arugula in the center as a heaping mound. Transfer beet and tomato mixture over the bed of arugula. Drizzle with more dressing if desired and sprinkle with salt and pepper to taste.